If there is a hall of fame for under-appreciated or misunderstood movies, then “The Family Man” belongs in it. Despite this informed opinion, “The Family Man,” starring Nicolas Cage and Tea Leoni, met with lukewarm reviews by critics and movie fans when it came out in 2000. The story opens with a day in the life of Jack Campbell, a thirty-something, wealthy investment banker who captains a boutique investment firm on Wall Street. Jack is intelligent, ambition consumed, bold, self-centered, and charming. Even though his life revolves around the pursuit of money and the pleasures of the flesh, he is hard not to like. His appreciation of classical music and opera displayed in the opening scenes hints at the presence of a soul. 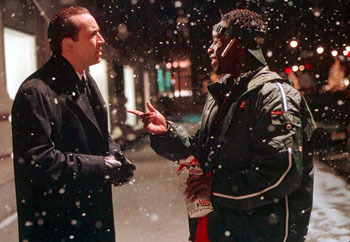 When this movie was made, Nick Cage was still at the height of his acting career. I believe Jack Campbell is one of his more memorable roles. All of the characters in the movie, for that matter, are finely drawn and acted. After becoming acquainted with Jack Campbell and the world he inhabits, the screenwriters (David Diamond and David Weissman) waste no time in spinning the tale. Jack drops into a fast-food mart after work on Christmas Eve to buy eggnog and stumbles into an armed altercation between a disgruntled customer and the store owner. Jack intervenes to prevent a violent incident by offering to buy a lottery ticket the owner claims is a fake. In the aftermath, outside of the store, Jack speaks with the disgruntled customer, played by Don Cheadle. Cheadle happens to be an angel on a routine mission designed to teach the Chinese convenience store owner a lesson in racial tolerance. The owner doesn’t learn his lesson, which puts the angel in a foul mood. Unwittingly, Jack contributes to the angel’s frustration with the human condition by making a condescending remark indicative of his superior attitude. The angel decides to teach Jack a lesson by sending him into an alternate reality that “might have been” if he had not deserted his college sweetheart to launch his career as an intern at an investment firm in England. The angel gives Jack a chance to get a “glimpse” into a life based on a completely different set of values than the values he now holds dear. A big dog slurping Jack’s face wakes him up in bed next to the woman he left cold “in real life.” He is shocked and horrified when two young children pile on top him. The kids are under the ridiculous impression that Jack, a lone wolf of Wall Street, is their father. In “The Family Man” Jack’s disdain for middle class values slowly turns into respect, caring, and finally a deep concern for the people who surround him. This synopsis really doesn’t do the movie justice. I found almost every scene in the movie poignant. Many of the scenes are multi-layered with subtle observations about human nature and social issues. The dialogue and situations are clever and insightful without a hint of cliché. The movie moved me to the point of tears in three or four scenes. One example involves Jack’s relationship with the little girl who would have been his daughter in his alternate life. The little girl, Annie, senses Jack is not her “real father.” She concludes Jack is an alien and asks him where the mother ship is so she can get her father back. Many critics commented that the movie over-sentimentalized middle class life. I disagree. I feel the movie artfully portrayed the bumps and warts of middle-class existence, as well as the pitfalls and emptiness of Jack’s investment-banker life. Neither of the two Jacks had it all. Regardless, I found the lifestyle issue secondary. The element of the movie that spoke to me the loudest was Jack’s transformation. “The Family Man” isn’t the only movie I liked that critics and movie fans, in disturbing numbers, deemed “overly sentimental.” Either my sensibilities are inverted, or I’m incredibly sane. Whatever the case, I’m sticking to my guns. I just want to point out that as the world grows more cynical and hardened, it appears good movies are becoming an endangered species. I believe there is a direct connection here. Think about it. Fictional movies reflect our world while creating their own realities. They are, by definition, abstractions. However, good movies have the power to inspire us to rise above fears and other roadblocks in the way of a better life and a better world. They teach us, often, to listen to our hearts. This isn’t always easy. One has to develop a relationship with one’s heart to hear it. Feeling, I find, is a first step in cultivating a relationship with the heart. I believe that cultivating a relationship with the heart is essential to leading a full life. There is no one way to do it, but I feel strongly that the human heart needs to be cultivated, just like abs, biceps, WordPress blogs, and Facebook pages. I liked the “The Family Man” because it made me feel. I practice meditation every day to cultivate a relationship with my heart. You might say the practice helps to “tenderize” my heart center. This movie reminded me that I have one. This entry was posted on August 30, 2012, 9:28 pm and is filed under Essays, inspiration, movies, musings. You can follow any responses to this entry through RSS 2.0. You can leave a response, or trackback from your own site.